Q: Can you take me into some staff meetings? What was the dynamic there? CC: Well, it actually worked very smoothly. Coach Osborne at that time pretty much spent all his time on offense, and defensively at that time you had Charlie and Tony and George and you had Kevin and then you had Craig. We would watch film together. And Charlie and George would focus a lot on the run game along with Craig, and then George and I the passing game. It just flowed so smoothly. You’d watch all the cutups together on Sunday night and Monday and Monday night and start putting ideas together on the board, and that game plan would pretty much be finalized by the time you hit the field on Tuesday. It just flowed so smoothly because of the people like Charlie and Tony and George being such great leaders. There was no egos. None, in no way, shape or form. Q: You’ve made a few stops. Is that a little of out of the ordinary? CC: It certainly was unique in a high-pressure, high-intensity atmosphere like that. I’ve been fortunate, the places I’ve been, it’s worked pretty well. But you hear of different places and different staffs and the dynamic is otherwise. I would tell people how smoothly it flowed at Nebraska. And listen, every now and then there was a differing opinion, but when the final hammer was put down they left that room on the same page. Q: Now, during the games George Darlington was up in the press box, right? CC: George was up in the press box along with Tony Samuel, and down on the field was myself, Charlie, and either Kevin or Craig the last two years. Charlie would signal in the front and I would signal in the coverages. Q: Take me into the dynamic between you and George talking amongst yourselves and your handling of things on the sideline…. CC: You know, again, it’s a high-intensity thing. You only have so much time. Most of the time we would see the same things, although from up above you could see things a whole lot better, that’s for sure. You know, after each series coaches would talk and any adjustments that had to be made in the secondary, we’d go over with the guys on the board, and Charlie and Craig would handle things with their guys. Q: Correct me if I’m wrong, but I’ve always been of the opinion that Moose Mohnsen and Bryan Carpenter running films, did they make things much easier on the coaches for the game prep? CC: No question. Those guys did a fantastic job. Great guys. And of course, Moose is coaching now. So I run into him every now and then. But you’re right, those guys would work hard and work late into the night. Incredible preparation, everything was always ready and on time and clean and made the coaches job that much more efficient each year. Q: What are you most proud of about your time there? Q: You’ve got a gal who understands football! CC: I sure do. I’m so appreciative of those three years there. And the players? They impacted me greatly, being so coachable. And no egos there, either. It was a pleasure to be around the Minters and the Mileses and the Velands. Just great kids. Q: And the unity. Is there anything about the confidence, the swagger, the belief you try to inculcate into your own players now? CC: You know, the one thing I try to share with my players -thinking back to those years- was really just how hard those guys worked. And certainly the unity (and we have a Leadership Council here at Cornell.) 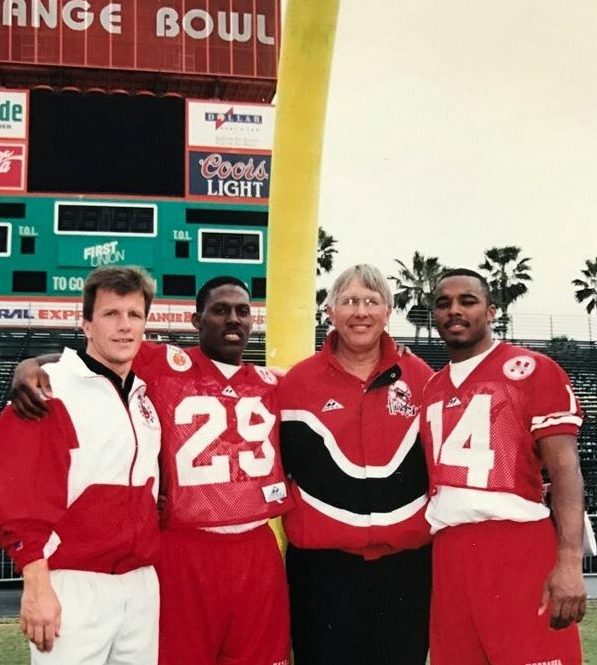 The great thing about the Unity Council at Nebraska was: one, you gave the players a voice, and number two, you were teaching them how to be leaders, also. Sometimes we take for granted that kids with a certain status or a senior, that automatically they know how to be a leader. And these days -with all the kids and the things going on in their lives- you get to teach them how to be leaders. That’s what I took from the Unity Council and how it was implemented. I tell my players today about that. And one other thing I try to impress upon my guys here is the practice tempo. You’ve got to practice 100 miles per hour. I say, ‘Guys, listen. 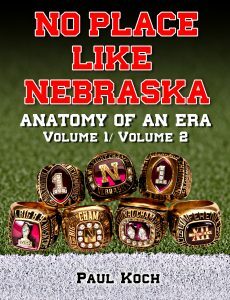 Back in Nebraska we had to get them to gear down, because they were going so hard and so fast all the time.’ The tempo, that’s the thing that stood out. Q: Is it difficult to get kids these days to practice at that tempo? CC: I don’t know. I don’t think it is. You just constantly have to stay on it in a positive way and constantly reach them. And because of working with Coach Osborne, I’m not a yeller and a screamer. You just constantly have to not take anything for granted, you constantly have to be looking for ways to push them and motivate them to get them to practice. Especially here at Cornell University where they’re getting pounded academically all day. When they walk into the football building it’s football time. Q: How is that Leadership Council working for you guys? CC: We just put it in place, Paul, just this past February. 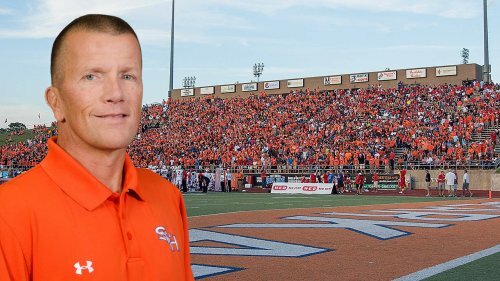 We didn’t have it in place up ’til now, and it’s something I kind of nudged my head coach on over the years and thought it would be a good idea, and we finally put it in place. We haven’t had it in place for the season, but they’ve done a fantastic thing with it thus far. Q: Now, when it came to recruiting, were you involved in that? CC: At that time GA’s were not allowed to go on the road, so I was on campus in the office, evaluating film, and helped on the weekends. But we weren’t allowed to go on the road at that time. Q: Any one particular game stand out to you from any other? CC: Well, I would have to say that first national championship game against Miami. Being part of Coach Osborne’s first national championship, that game certainly stands out. And probably the very, very first game was against West Virginia in the Kickoff Classic in the Meadowlands. That meant a lot to me, too. I certainly remember that one, too. I had family there. My parents were at that game and some of my family. And beating Florida as badly as we did stands out, too. But the locker room after that Miami game? Just the release of emotions was something special. It was crazy in there for a long time. The release of emotion -I remember the players, obviously being very happy and joyful and emotional. Not only Coach Osborne, who’d been there a long time, but Charlie, Milt, Dan, Tony, they’d been there a long time, too. Q: I’m a firm believer that most people, when they achieve a certain level, they start to cruise and take it easy and rest on their laurels. What do you think made the kids come back even better and stronger the next year in 1995? CC: I think it was their incredible work ethic and incredible desire to succeed, to stay hungry. And again, even though the coaching staff was very happy -the next day, Paul, I remember on the plane the next morning, there was the big celebrations there at the Devaney Sports Center, and then everybody went about their way- honest to goodness, the next day after the celebration we were in the office at 8 a.m. having a recruiting meeting. It was business as usual. And that was Coach Osborne, an astounding influence, never getting too high or too low. Less than 36 hours later we were in there having a recruiting meeting. Q: You didn’t stay around Miami Beach drinking mai-tais, eh? CC: No. (laughs) It was all on an even keel. There was no emotional rollercoaster. I think that had had a lot to do with it. Q: Can you tell me more about Charlie McBride or Coach Darlington? CC: With George -and I worked very closely with him- he’s a very, very smart football coach. A very solid man who treated me very well and leaves no stone unturned. Very prepared, a ton of X and O knowledge, and treated the players well. Charlie, he was probably the ‘Mr. Intensity’ of the group. But the thing that stood out to me, Charlie treated me great from the first minute I met him. And again, everybody did. And those players loved Charlie and would go through a brick wall for him. Those players, Grant (Wistrom) and Jared (Tomich) and Christian and Jason (Peter), they knew that Charlie loved ’em. That’s where he had a very good player-coach relationship with his players, that really stood out to me. Q: How did the players know of this love for them? How was it displayed? CC: It’s probably because he pushed them hard, particularly the defensive line. He would push them hard, but he was a guy who knew you could push them hard and push them hard, but you better be sure you give them a hug. I remember him saying that one time when we were sitting around. You push them -and it didn’t matter who it was, a scout team kid or Christian Peter or Grant Wistrom- they don’t care how much you know until they know how much you care. There was a great mutual respect there with Charlie and all the players, not just the D-line. They knew just by daily actions and what he would do for them off the field, how much he was there for them. Q: What kind of off-field stuff? CC: Anything. They just knew Charlie was in their corner, as a reference for a job or picking up the phone and calling someone for a shot in the NFL. They just knew they could come to him and he would pick up the phone for them. Q: Any other things stand out to you as far as your coaching, things you gleaned from those days that you find yourself always using? CC: Philosophically, one of the things I still carry with me is: you don’t need to try to make the game confusing. You don’t need to reinvent the wheel. You have to let the players play. Charlie and Tony (Samuel) were big advocates of that. Less is more. If you wanted to play fast you better not burden them down mentally. And one other thing even more important than the X’s and O’s, it is the trust and relationship part of it, and mutual respect between the coaches and players. Nobody really ever raised their voice, except Charlie a few times, over the years. The ultimate thing, I think, was the great relationships there and the total trust between players and coaches. I think those are the main points there that mattered. It’s great reminiscing about those years, I tell you. As we continue on like prospectors making our way up the trickle of a promising mountain stream, it feels like we’ve traded in our smallish pan for a massive sluice because the golden nuggets keep appearing left and right, validating that we’re on the right path. One of those priceless finds was Clayton’s knowledge about his former high school pupil, University of Miami’s starting quarterback Frank Costa. I have a sneaking suspicion that he downplayed his accumulated personal insight about the kid, and had a few precious tidbits for the Blackshirts in preparation for that pivotal ’94 National Championship game. We all know the Hurricanes had the benefits of their home stadium, home locker room, home climate and, for all intents and purposes, the home crowd, but getting into young Costa’s head had to be the Huskers’ ace in the hole. What made it all the more providential was the fact that the ’94 team actually yearned to meet up once more in the championship contest with Florida State, and not Miami U. As for the Carlin/Costa connection, I guess sometimes a guy just gets a little lucky in his hiring practices, eh? 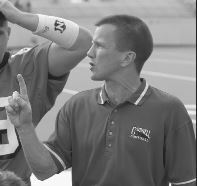 Coach Carlin sure drove the point home about the level of professionalism and welcoming arms as he joined the Nebraska Football family, by both coaching staff and the players. Notice his comments about the lack of player egos and how they were such joys to teach, “And the players? They impacted me greatly, being so coachable. And no egos there, either. It was a pleasure to be around the Minters’ and the Miles’ and the Velands’. Just great kids.” You don’t’ get that very often. But from Clayton’s recall, as well as that of my own, it’s surprisingly true that most every individual ego within the organization was suppressed, or at the least, willingly subjugated for the betterment of the team. I believe it was former U.S. President Ronald Reagan who said, “You can accomplish much if you don’t care who gets the credit.” I equate ego with a tendency to seek attention and personal glorification, and for the most part they players never seemed too concerned with drawing attention to themselves aside from their on-field performance. How refreshing.